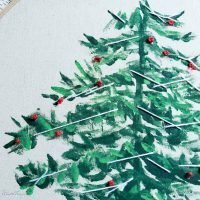 I made a large DIY hoop art project for last year’s Canadian Christmas Home Tour and as I had materials left over and a spare hoop I thought why not do a tutorial? 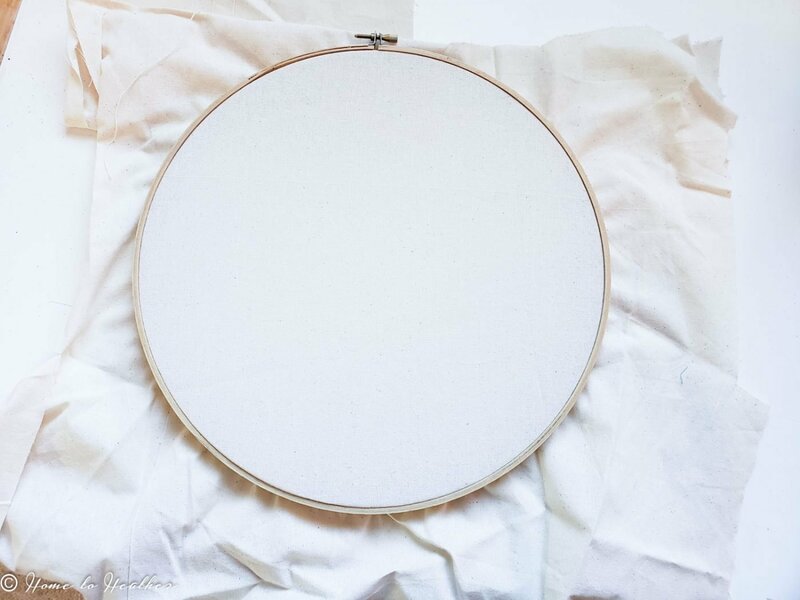 Start this DIY Room decor project with a simple embroidery hoop (I thrifted this one) and a scrap of fabric. I used muslin but use whatever you have on hand. No expensive artist’s canvas required. This is such a fun and quick project to work on and it gives loads of leeway to design it however you wish. Don’t have green paint? 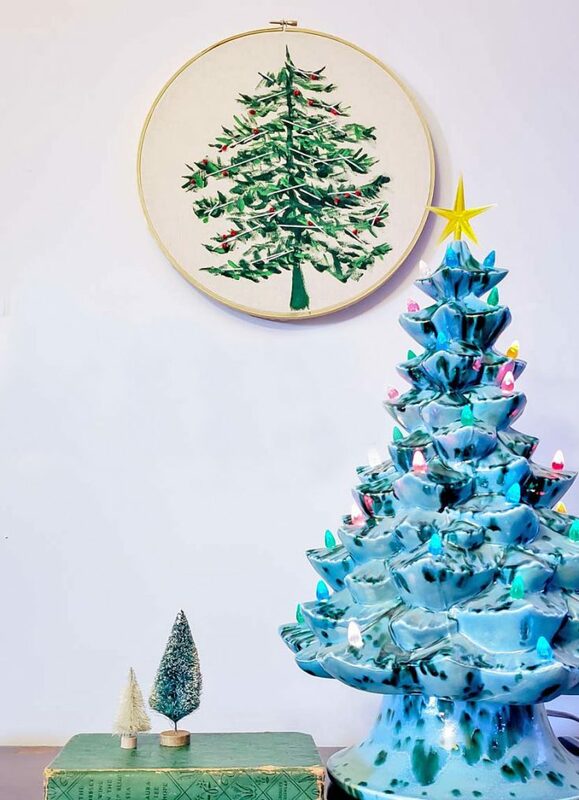 Do a blue tree! use up your leftover fabric scraps and really make it your own. Why not a whole forest? Do what you wish with the idea. I made a little video that shows how I painted the tree. I know it might seem complicated or difficult but really, anyone can do it. There are very few tree rules when it comes to painting but the biggest tip I can offer is to leave enough space between your branches. The brain is a wonderful thing and if it sees a tree shape it will tell you ‘that’s a tree’ so please don’t stress about making it perfect. Once it’s on the wall, it’s going to be fantastic. I used two colours of green because I think it gives some depth to the shape. But you certainly don’t have to and you could use more than two as well. 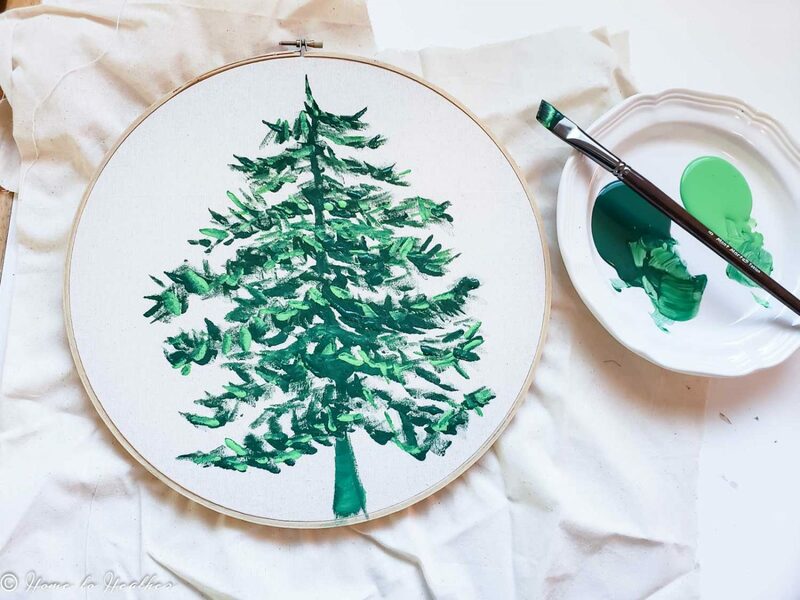 Once your tree is painted, allow it to dry before you begin to stitch. Make long, straight stitches for snow. Criss-cross them where you wish for interest. I used the whole strand of embroidery thread for weight and depending on the size of your hoop art you could use fine yarn for a large item or even single strands of thread for tiny hoops. Once you’re happy with your snow, add in some berries. 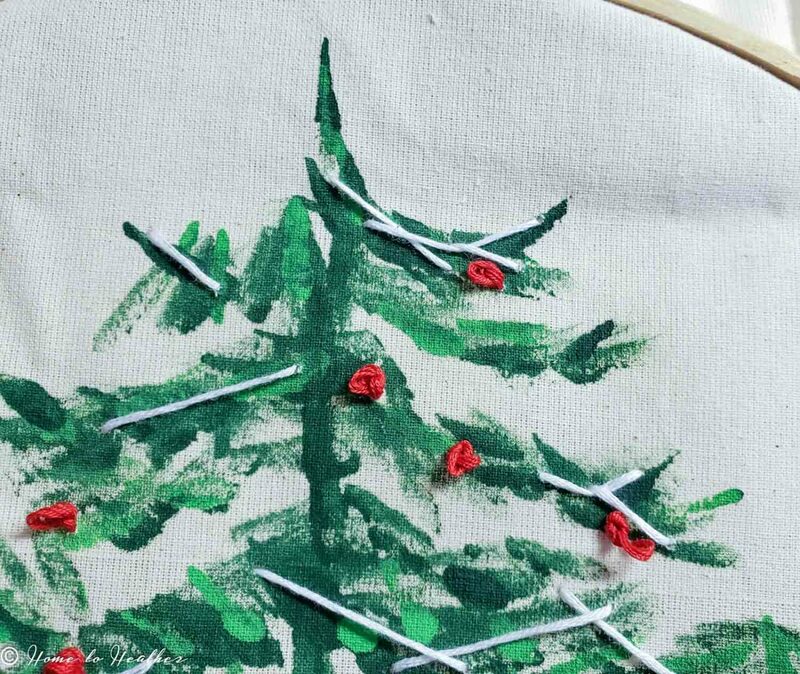 French knots are simple to do – just bring your needle up through the fabric, wrap thread around the needle three times before sending it back down again. Work slowly to allow the thread to wrap into a knot without tangling. Fit fabric into your hoop and pull taught but don't over stretch. Paint a tree. It doesn't have to be perfectly artistic. Start with a trunk down the center then create feathery branches to the left and right of it. 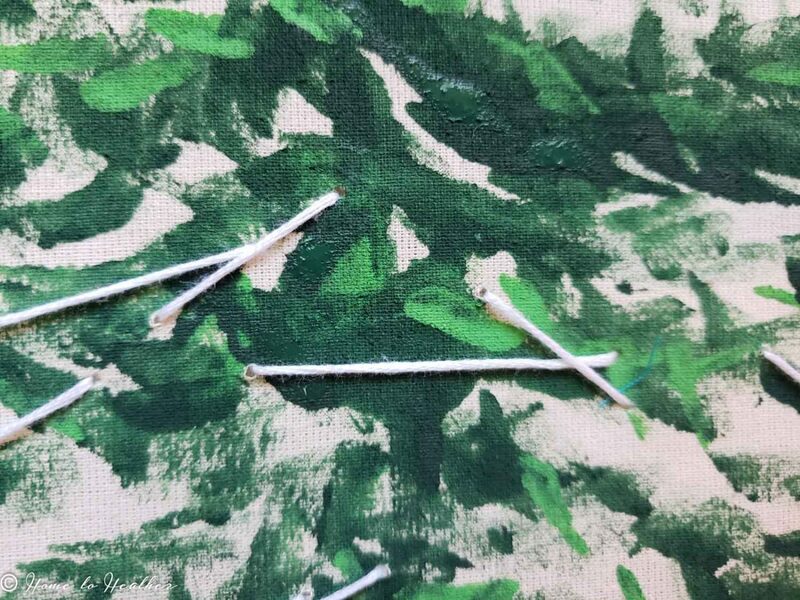 I used a flat brush and twisted it this way and that to create branches and needles. Don't forget the base of the trunk, widen it out a little. 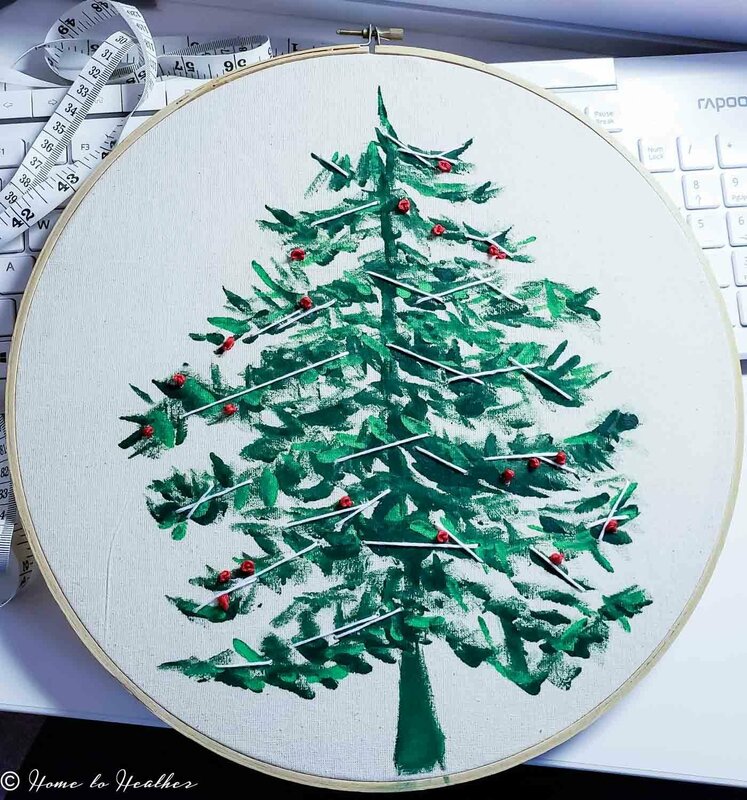 Add snow with long straight embroidery stitches. Criss cross them if desired and add as many or as few as you wish. Add berries with French knot embroidery stitches. To make a french knot, bring the needle up through the material, wrap the thread three times around the needle and pass it back through, allowing the thread to gather and tighten into a round knot. Adjust the tightness of the fabric as it may have loosened during stitching. This craft is designed to use up things you already have. I used muslin fabric but I encourage you to try any solid colour fabric you have on hand. Even an old t-shirt would work. The same goes for paint - don't have green? Try a blue tree! Make it your own. When you like how it looks – you’re done! If the fabric has loosened as you stitched, pull it taught again. 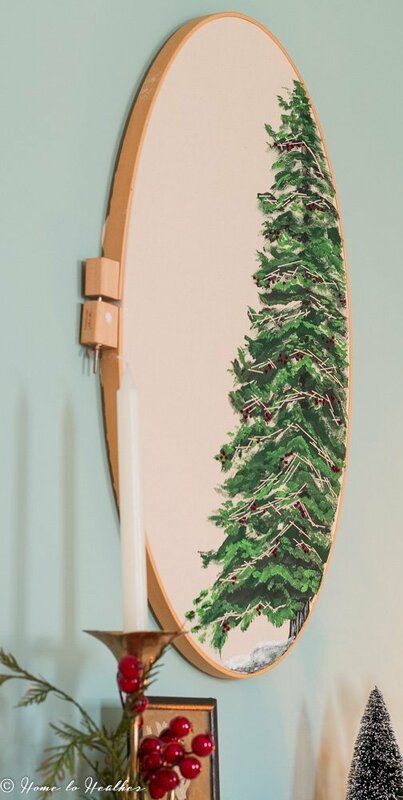 Trim off the excess then hang it up and enjoy your Christmas DIY Room Decor! Last year’s piece was larger and more detailed. Make yours your own!